What does it take to create and implement a biobased product? Learn how to convert molecules through microbial processes. Find out how to choose the right host organism and how choices in process design influence cell growth, substrate conversion and product formation. Explore catalytic conversion of biomass by discussing types of catalysts, special challenges for catalysis when converting biomass and the interplay of catalysis and up/down stream processes. Learn the steps to transform a biobased product to a winning business case. We’ll discuss commercial, financial and organizational aspects and stakeholder management to realize biobased ambitions. You’ll also learn about the required dynamics in and timing of (innovation) activities for a sector transformation to a biobased economy. 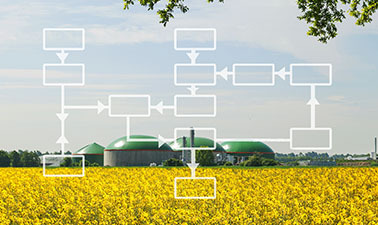 Understand the biobased supply chain including network design and geographical allocation of processing steps answering the key questions where to produce, how to transport and where to process biobased products. Learn the economic basis for government regulations and implications for the biobased economy and in particular the responses by the private sector. This includes the economic foundations for government regulations from different perspectives, the implications for an economic assessment of regulatory policies and a look at the regulatory policies in the United States and the European Union.